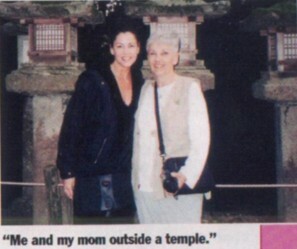 Taking full advantage of some time off from PORT CHARLES, work-traveler Julie Pinson and her mother, Elissa, decided to add another stamp to their passports by visiting Japan. Although the trip required an 11-hour flight from Los Angeles, looking back, the ladies admit that it was well worth it. "We stayed at the Righa Royal Hotel in Kyoto and the Keio Plaza Hotel in Tokyo," reports the actress. 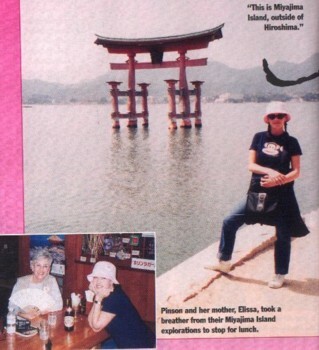 "We also visited Hiroshima, Hakone, and Nikko." Mother and daughter compromised while planning their daily itinerary so that both vacation agendas would be met. "I liked Tokyo the best, because I like to shop. My mother likes to visit all of the landmarks. We saw a beautiful temple in Nara, outside Kyoto. And the Kaboki Theatre in Tokyo was another of my favorite memories." So, what did Pinson purchase during her Japanese shopping excursion? "Little gifts for the cast, and shoes,' she shares. "It was hard, however, to find shoes in my size, because Japanese women have small feet! Abut it surprised me that the people are rather tall." While touring the country opened Pinson's eyes to a whole new world, she drew the line at experiencing Japanese cuisine�Eespecially sushi. "I don't like fish, so I stayed with salads and the occasional McDonalds," she laughs. Overall, the trip left both Pinson and mother with a lifetime of memories - but the actress won't be looking herself a return flight anytime soon. Declares the globetrotter: "Seen it, done it, been there!"